This morning several people woke a little bit earlier and helped put Week 8 in motion. We had five water stops to plan with four physical locations, all to be done without me due to a broken power steering pump in my car. Walt stopped by at 7:30AM on the morning of his birthday (Happy Birthday Walt!) to get supplies over to Wakefield HS for us and Donna swung by to bring him back to the start. Julie picked up a container shortly after and headed over to Breakheartâ€™s Saugus entrance and Jen picked her up on her way to Brueggers. Dave placed his ice cold cooler over by Lake Quannapowit and Catherine parked her Jeep full of rehydration by Nahant St. Lois picked them up on her way in and everyone was there before me. Due to a broken power steering pump I started my 18.1 mile run with a Â¼ mile walk to Brueggers. Rick stopped by there for some last minute assists to the stops to make sure everyone had exactly what they needed. With everything going to plan seventeen of us headed out the door and up Main St. The blue skies, cool air and comforting breeze made this a perfect day for a run. As we passed Ell Pond a sprinkler was soaking the sidewalk but it was too cold and too early in the run to need it. Heading down the LynnFells Parkway toward Saugus we were treated to the road kill of the week, a small snake squished on the side of the road, a first for the Sunday Run, which was celebrated with a small yet active I-Hate-Snakes dance by Ginny, Jo-Ann, and Lois. Also seen along this stretch was a three-wheeled pick-up truck, two in the back and one in the center of the front. These interesting sights kept conversation lively as we made our way to the first water stop at the Kabuski Rink at the Saugus entrance to Breakheart. With all the planning and volunteering for the water stops there was a slight hiccup at the first one. It was locked when Walt, Judi, and James Horne arrived and unsure which car was actually the stop they moved on to the water fountain and the second leg of the run, a loop around Breakheart counterclockwise. Brian came in next and circled the car as Dave and I pulled in and awaited Julieâ€™s arrival. She was more surprised than anyone that it was locked since she had even noted that she needed to keep it unlocked when Jen picked her up. For us it was no big deal because she had the key. We stocked up on our fluids and headed into Breakheart. There was a cheerful mix of people walking through this morning, with â€œThey went that a-wayâ€s and â€œI would join you butâ€s and â€œWhere all these runners coming fromâ€s many people said hello as they crossed our paths. One man really enjoyed chatting as we moved along claiming he had already runâ€¦ earlierâ€¦Â a half a stepâ€¦ a little while back. As we moved into the hilly section the fun stopped though and serious faces took over as we scaled the ascents and rode the descents back to the parking lot. After a quick stop at Julieâ€™s car the 9 mile route took six runners back past the snake the way we came. The long runners turned right and headed to Farm St in Wakefield. The hills here are longer but not as steep as Breakheart but in the bright warming sun they offered an equal challenge. The cool wind was whipping in circles through the hills offering occasional relief from many directions. Catherine and Kelly made up their own routes, accidentally running the inner loop and ended up coming out the Wakefield side of Breakheart where they met us over at the third water stop at Wakefield HS. After some snacks and Gatorade we headed out for the 4th three mile stretch of the run. Following the old Wakefield Law Enforcement route we followed the hills of Montrose St to Rte 129 which led us over to Lake Quannapowitt. I ran this leg with Eve and Carol, swapping training and marathoning histories with each other. After hitting 129 I left them, pulled past Catherine and Kelly and fulfilled a promise to Dave that I had been threating all morning â€œIâ€™ll be catching you laterâ€. Each water stop prior I would pull in right as Dave was heading out and I would remind him that he would be seeing him later. On this stretch I finally did catch him approaching the lake and he let out a â€œdarn itâ€. We made our way over to his car, water stop 4 side by side. The pack regrouped there and took the cool (from a cooler) beverages Dave supplied, his unmelted Snickers, and some Gu that Rick had brought to help reenergize the troupes. Carol and Eve both had never had Gu, Carol has run 12 (I believe she said) marathons without ever trying it. I insisted both bring one with them to eat at the next stop, just to try it out and get used to its not so pleasant texture. They resisted, I forced the issue and off we went, each carrying a Gu to the next stop. Dave described the next stretch of the run as an old video game, sort of like the Donkey Kong variety. It seemed we were running against the tide along North Ave, the sidewalk littered with walkers, the roadside well traveled by bicyclists. We kept hopping off the curb to give room to the walkers and then forced to hop right back up to avoid a bike. This went on as we made our way to Church St and over to Main towards the final waterstop. At this stop we prepared ourselves for the last stretch. Catherine and Kelly discussed how they were going to tack on an extra mile with a loop around Ell Pond to make up for their earlier shortcut. Ginny decided to run another 1/10th of a mile to make 15 and call it a day. As Lois made her way to the stop our group headed back Main St towards Melrose, Ginny decided to head back Main St to the lake and run back to the stop with Lois. Lois however was making her way via North Ave, inadvertently taking the Ginny shortcut from an earlier run this year. From where she was she could see Ginny heading to the lake and didnâ€™t know why. As Lois pulled into the stop and asked Rick what Ginny was doing, he did a double take and screamed down Main St to get Ginny to come back. Despite the comedy of the event Ginny got her extra 1/10th of a mile in and took the ride back to Brueggers with Rick while Lois headed out behind us down Main St. The last leg was warm but the swirling wind kept offering relief. We made our way along Main St into Melrose, Rick and Ginny offering a beep and a wave along the way. We all finished up strong, although Catherine and Kelly opted out of their loop around Ell Pond, and were greeted by a cleaned up Judi already on her way to recovering from her run with a cup of water and a bowl of Brueggers soup. Good run by everyone. The group stuck together both in getting the water stops all set up and helping each other cover 18 miles. Youâ€™ve earned a restful Labor Day. As summer comes to the close and the kids head back to school our Sunday Long Runs are just beginning a stretch of some intense training miles. This week is 18 for the marathoners, 9 for the half marathoners. This route is a tough one to cover water stop wise so all the help I can get will be needed. The run begins with a trip out to Breakheart along the Fellsway to the Saugus entrance. We need one stop in the parking lot there that we’ll pass going in and coming out. From there the half marathoners follow the same way back to complete 9 miles. The long runners head out to Farm St. If you ran the Law Enforcement Half when it was in Wakefield you’ll recognize the next part of the run. With a stop at Wakefield HS (Walt’s covering this one) we’ll head out Montrose St to Rte 129 and head over to Lake Quannapowitt. Another stop in the Converse parking lot starts the next stretch down North Ave to Main St. One last stop at the corner of Nahant and Main before heading back Main St to Brueggers to finish off 18 miles. Â That’s 5 water stops which means I may need 5 or 6 volunteers this week. Demi has volunteered the help of her and her kids. Before I figure out the tasks let’s see who’s willing to help with either the use of their car or pick up/drop off duties. So Roll Call: who’s running and who’s willing to help pull this one off? I’ll start figuring out who’ll have to go where and do what once I get the list of helpers. Week 7, if youâ€™re running a marathon in mid-October youâ€™re halfway there. Halfway in weeks that is, from here the mileage ramps up quickly and stays up until its taper time. This morningâ€™s weather was perfect for running. Considering its August, you canâ€™t complain about low 70s and breezy. Altogether we had 24 runners participate in the long run, not all started at the same place, not all ended at the same place, but as far as I can tell nobody got lost this week. Peter and Erin took care of leaving a car full of refreshments in the parking lot of Horn Pond in Woburn while Walt left his car at its usual perch by I93 in Winchester. The route took us down Main St to W Wyoming and out to Spot Pond for a bit. Kaj and I ended up in the front of the pack and wondered time and time again why nobody was passing us. We pushed the pace as 12 more runners stretched out behind us, past the zoo where we spotted a pack of wolves getting in their morning jog, past Friendlyâ€™s where we picked up our pack of 6 half marathoner trainers, and past a sign alerting us to the location of Joeyâ€™s 2nd birthday, and over to Waltâ€™s car. After Kaj and I pulled in and began pouring drinks, waves of runners came in handfuls at a time behind us. Walt, who had run from his car and arrived at Brueggers after we had left, was the last runner into the stop as he had planned. Usually one of the rabbits in the group and always quick to leave a water stop, Walt enjoyed the party atmosphere of 27 runners huddled around his car in a Gatorade feeding frenzy. This week our new system of cup reuse was put into full effect as each runner put their name on a plastic cup with a Sharpie so they could use it on the way back. That is everyone but Sue, who was looking at Erin as she was writing and found that she had marked her cup â€˜ERINâ€™. That would break the system, so added a (Sue) notation next to it to avoid confusion. With the back of Waltâ€™s car lined with cups the group headed out. Jen, Denyce, Julie, Jocelyn and Kevin were the first to leave the stop, having run less than a mile to get there they didnâ€™t need as much rehydration. Walt was next out since heâ€™s never one to dawdle at a water stop. Brian and I headed out after him, in an attempt to keep Walt on course I decided to do my best to keep pace with him to the pond. Behind us the rest of the runners began their charge down Forest St to Washington St where Joanne jumped in and alerted us that Nancy had called ahead to her to let us know she had dropped out. Nancyâ€™s battling a nasty Achilles tendon issue, heal up Nanc! We turned on to Cross St and passed the lead group, Walt encouraging them not to let us pull ahead too easily. At that point I was in the lead again, under the railroad tracks, past the â€œWelcome Back, Aliciaâ€ sign welcoming Olympic gymnast Alicia Sacramone back from Beijing, over to Rte 38 in Woburn. With a right onto Main St and a quick left onto Lake St we were on our way to Horn Pond where Peterâ€™s car awaited us with water stop 2. Also awaiting us was a hot dog vending cart which couldnâ€™t tempt any of us to partake. Unlike the public bathrooms which I hear had lots of partakers, so many that some women spilled into the menâ€™s room! Walt bolted out of the water stop as if he was Usain Bolt, owner of the world record for the 100m dash set at this yearâ€™s Olympics. Brian, Julie and I headed out behind him with no intention of keeping up with him. The loop around the pond is littered with left and right turns that lead to places Iâ€™ve never been. We weighed the odds of Walt getting lost, and wondered who behind us may wander off track. Some took more scenic routes, some took less hilly routes, but we all made it around the pond. Passing the wood carving of a Native American Indian girl holding a fish, past the shirtless guy with the ginormous pecs and muscular arms that donâ€™t swing when he runs (Lois and Sueâ€™s â€œfriendâ€ from when we ran this route back in late April), over the causeway that cuts across the far side of the pond, past a reported flying fish jumping out of the water, over the hill if you so chose to take it or the path that hugs the pond, ultimately ending up back at Lake Ave. Here Julie decided to cut back over to the water stop for a sip before continuing on (or was she just trying to lose Brian and I?) Brian and I followed a runner off Lake Ave to Main St and Cross St, finally passing him as we approached the railroad bridge underpass. I kept asking myself â€œis that one of our guys?â€ but it wasnâ€™t. Heading back up Forest St Brian pulled ahead as the pace on the way out was starting to show on my tired legs. After we got a drink and headed out we spied Kevin coming into the water stop, and shortly after him runners began trickling in. Sue, who had planned to finish with Joanne by the Gingerbread Construction Company convinced herself that running up the hill back to Waltâ€™s car was something she shouldnâ€™t pass up. Love the hills, theyâ€™ll love you back. Way to go Sue!!! The last 4 miles of the run cuts through Stoneham over to Franklin St. Near Weiss Farm Sue Worrall passed by on her bike and called out to Brian and I. She looked a lot happier than we did. The sun along Franklin St got hot and the temperatures were rising.Â Brian pulled ahead finishing the run strong while I trailed back and found a noticeably slower pace for the last mile. Heading down Main St into downtown Melrose I passed Betty Kandler pushing Annika in a jogging stroller, both looking a lot happier than I did. But minutes later I was done, and shortly after that runners began streaming into the finish of the 14.1 mile route. Kaj, Mike, Dave, Ginny, Slater, Demi, Erin, Peter, and Lois all completed the full route. Great job everyone! Strong runs on an enjoyable route. Each session of the Sunday Run I detect that the back side of Spot Pond and the Fellsway East grows somewhat tiresome after about 10 trips so in the interest of keeping things interesting, this week we’re heading someplace new: Horn Pond in Woburn. Unfortunately for the shorter distance runners this means you’ll be running the same roads you ran last week, except backwards. Well the route is reversed, you don’t have to run backwards, although that would really make it interesting. The route maps were posted this morning. If you printed them out earlier this week to commit them to memory in an attempt to avoid what happened last week… rip it up and forget all you learned. This week we’ll head up to Spot Pond, past the Zoo over to our water stop off Forest St by Rte 93. 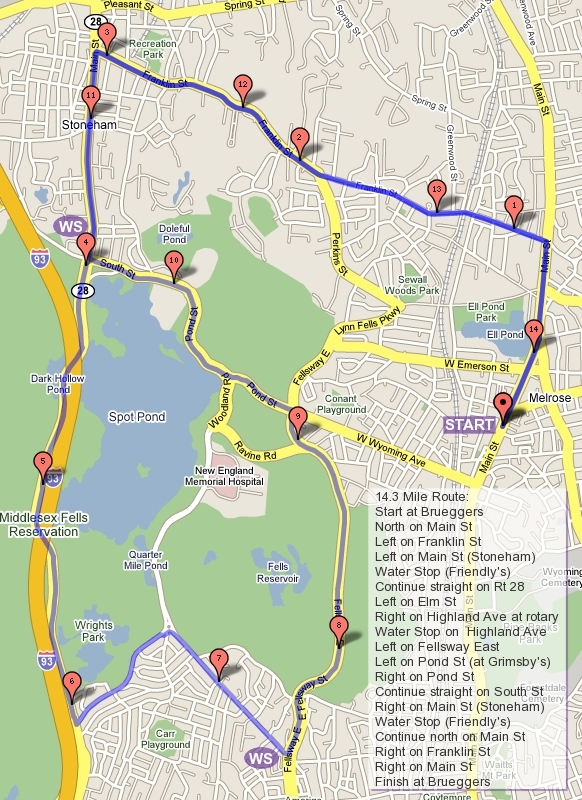 From there the shorter distance runners will head backthrough Stoneham to Franklin St to Main to finish up. The longer runners, if they so choose, will follow Forest St to Washington, cut across Cross St to Woburn. Main St in Woburn will take them to Lake Ave which won’t take them to a lake at all but will take them to Horn Pond and our second Water Stop. A loop around Horn Pond (listen for the sounds of Native American Indians, the pond is rumored to be haunted)Â and back the way we came to Water Stop 3, right where we left it as Water Stop 1. From there we cut through Stoneham just like the shorter distance runners before us, to make our way back to Brueggers. For those running shorter, here’s an alternate option: Meet us at Brueggers and carpool to somewhere along the full route to jump in,Â either at Friendly’s for a 8.5 mile run or the first water stop for a 7 mile run. Although we learned last week we don’t always run what we planned, I still want to know who’s in and what do you plan on running. Does everyone know where theyâ€™re going? Each week as we assemble on the sidewalk outside of Brueggers the run is kicked off with those words. Each week there is an iffy answer in the affirmative. This week was the kind of week that makes me ask this as this recap will illustrate. At 8:00 I rushed over to Brueggers, running a bit late since I didnâ€™t notice the 8 mile route map as page 2 on the map link and quickly remade one so people running shorter would know where they were going. These were not the people I should have been worried about. As Walt came in from his pre-run miles, and Linda and her MVS friend came in from their pre-run and pre-fall, and the rest of the crowd streamed out of Brueggers, I reviewed the water stop location with Jean, our water stop volunteer for the day, and went over the routes quickly so people would know where we were going. Walt asked if he could take the map with him but I decided I wanted to give it to Jean so she would know where to go and Walt could take it from her as he went by. Off went Jean, off went Walt, and off went the rest of the big crowd of 28 runners heading out to Winchester. Up Main St to Franklin the chatter in the crowd focused on the Womenâ€™s Olympic Marathon, held on Sunday Morning in China and televised Saturday Night on the East Coast. Inspired by the 38 year old gold medal run by Romaniaâ€™s Constantina Tomescu our running goals all seemed more achievable this morning. The stream of runners flowed along Franklin St into Stoneham and over to Winchester and our first water stop. At this point in the run everything was going fine. The shorter route returned to Melrose by heading over to Spot Pond, down to Grimsbyâ€™s, and along the LynnFells to Main St. As far as I know this was an uneventful 8 miles in comfortable weather along a winding routeâ€¦ unless I missed something. The longer route headed out Forest St to Highland Ave. If the sight of blood on Linda before the run even started wasnâ€™t foretelling an odd run the sights of an older man ambling up the hill towards us with two turkeys by his side definitely was a signal that this would not be a typical run. As we passed him we asked if those turkeys were with him, he said no, he thought they were with us. As our pack of Nicole, Eve, Mike, and myself passed by we noticed yet another larger turkey running off down a side street. As Lois and Sue passed the man the turkeys decided they liked the ladies better and turned around and ran down the hill with them for a while before the turkeys pulled ahead. After that sight the route turned onto Highland Ave with a pleasant, yet hilly side trip along Reservoir Rd. This is one of my favorite streets to run on. With the Fells on one side you catch a glimpse of the sun sparkling of one of the Winchester Reservoirs through the trees. On the other side of the antique street light lined road is a row of large beautiful houses. In the middle of the road is a long steep hill. (Love the hills, theyâ€™ll love you back). Nicole and I charged through the hill while Mike and Eve shook theirs heads at us. At this point I pulled ahead and ran along back on Highland Ave towards water stop 2. Hereâ€™s where things got interesting. At Highland Ave and Mystic Valley Parkway Walt took a left turn instead of going straight, not having a map to help him out. The pack behind him followed along thinking he knew what he was doing (Note: Never follow Walt). Nicole and I continued on to water stop 2â€¦ or the empty spot where it was supposed to be, maybe that map wouldnâ€™t have helped Walt because it didnâ€™t help Jean. We continued on with that â€œmaybe itâ€™s just around this cornerâ€ feeling for a little while but unfortunately Jean was waiting on a street corner somewhere we wouldnâ€™t be passing byâ€¦ those of us that were actually in the right place. As we headed down Main St over to Washington St near Winchester Center two people in white tank tops passed in the opposite direction. Mike and Eve noticed them heading to the left on Main St and, mistaking them for me and Nicole, followed themâ€¦ off course where they would coincidentally run into Walt. With some guidance from Sue and Lois correcting wrong turns from behind, last weekâ€™s two lost runners Kelly and Catherine stayed on course throughout the run. If youâ€™re keeping score, only 6 of the long runners were in the right place, heading down Washington St at this point in the run. Along this stretch Sue and Lois were on a mission to track down water. They passed on the idea of stopping at a church and stealing a sip of Holy Water, and instead found fountain to drink from, unfortunately it was filled with dirty water that they had to scoop out to make room for the heads so they could reach the tiny trickle that came out of the spout. From there we passed a dead raccoon on the side of the road which I named Rocky after Rocky Racoon in the Beatles song, a tune that stuck in my head as I climbed back up Forest St to Waltâ€™s car and what was now the second water stop of the day. Nancy was waiting there having cut her run short due to a sore achilles and informed me that I was the first one to make it back to the stop. Yikes! Where is everyone! From the water stop we headed over to Park St, past the man that was walking turkeys earlier in the day and over to Spot pond. Along the back side of the pond Nicole and I took turns passing each other as she pushed the pace up hills and I did the same on the downhills. This route, a very hilly one, even challenged Nicoleâ€™s passion for the hills as we made the last long climb up Elm St. At the rotary by the hockey rink we ran into Jean who pulled into the parking lot and supplied us with a bonus cup of Gatorade to get us through the last few miles. Not knowing who was where I guessed that Lois would be by but I had no idea who else would make it there. While I was saying this Lois was making her way back to Brueggers, either by foot or by car, the details are getting fuzzy on me now. Leaving the water stop we followed the pond to Pond St where I ran into Mike coming from the other direction. As we headed down to Grimsbyâ€™s we passed Matt making his way back from wherever he had been. Back down Wyoming we went, onto Main and back to Brueggers to end an adventurous day. In the end Nicole, Catherine, Kelly and I were the only four to run the full 16.2 mile route as it was intended. I can only speak for myself, as everyone else was wandering around Winchester and Medford I was having myself a darn good run. Thanks to Walt and Jean for volunteering to help this week, and thanks to all that ran today I hope you enjoyed the adventure.